Better life, all natural, gluten-free, chemical-free cleaners...better yet, they work! I don't usually go after products to feature. On any given day you can find numerous boxes that were delivered to my door for consideration. My email is full of companies asking me if I will do a review, or try out a new product. I am discerning, only trying the ones I think I would want to promote. In other words, I have to believe in the product. This time it was different though. 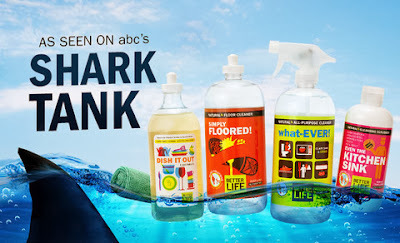 I sat back to watch one of my favorite TV shows called "Shark Tank". It is a show about entrepreneurs who are trying to get funding for their products. Being and entrepreneurial mind, I just love watching it. This time, my ears perked up. Two guys came out with their Gluten free & hypoallergenic cleaners, that are not tested on animals, and are safe for waterways & marine life. Boasting their PEOPLE. PETS. PLANET. mission. Well hello...where have you been all my life? I was interested. I highly recommend watching these boys in action on Shark Tank. You can watch it by clicking HERE. Then they compared their product to the leading chemical cleaner. They did not disclose which cleaner, but I was betting on lysol or pinesol. Their product cleaned way better. Then the guy squirt the product in his mouth... showing how safe the product is. That was it. I had to research them and see if it was really real. I am sorry, but I have been looking for a "healthy" cleaner that works forever. Not wanting chemicals in my house, but all of them fell short. So I went online and read their story: "In 2007 two life long friends, Tim Barklage and Kevin Tibbs, were watching their toddlers crawl across the floors and climbing up and around on all kinds of surfaces in the home (and then put their little fingers in their mouth of course). As concerned new parents, they began discussing the dangers of traditional cleaners and the toxic residues they leave behind. Tim (always the optimist) challenged Kevin, an innovative formulation chemist, to create a new line of cleaning products that set the standard in safety and work better than anything out there. Next I contacted them and told them I believe in everything they are doing and I have SO MANY READERS WITH ALLERGIES!!! I really wanted to tell you all about it, but I had to try it first. Can I just say that these products are AMAZING!!!!!! I am in shock. They clean twice as much as my horrible chemical (lysol) cleaners, and my house smells fresh and natural, not like chemicals. I enjoy cleaning with them. I would recommend this kit. You want to know the best part? This WHOLE KIT is only $25! I can't buy all my chemical cleaners for that. These are large bottles that will easily last me the entire month. I cannot urge you enough to get their products. You can buy them online and you can also get them at several stores like whole foods. You can view where to buy here. What are you waiting for? Now you can clean and keep the world a better place at the same time!